When I was hanging out in Emeril's kitchen, one of the first things he made were these stunning sweet potato biscuits. His recipe could be easily veganized by substituting earth balance for the butter, but I wanted to try making fat-free biscuits -- and with whole wheat flour, too. Since I had such good luck using bananas instead of butter in my maple-cornbread biscuits, I thought that would work here too, since these biscuits are also sweet and any added sweetness or hint of banana would be a complimentary flavor. Boy does it ever! The slight sweetness of banana really brings out the natural sweetness in the sweet potato -- and the hint of cinnamon (<-- HH's personal touch) ties it all together beautifully. These biscuits are just sweet enough that they taste a bit like a muffin but their texture and cute button shape is more like a biscuit. Serve them with tofu scramble, greens and a big ol' pot of Emeril's spiked tea---err coffee. 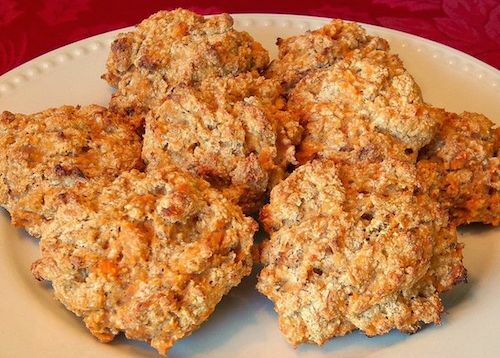 Nothing says Down Home Cookin' like a sweet potato biscuit! These biscuits are just sweet enough on their own that they could pass for a muffin, but their cute button shape proves they're a biscuit. Serve with tofu scramble and pot of coffee or tea. Cook and skin your sweet potato, then mash it with a fork or potato masher and set aside. Grease a cookie sheet or line with parchment paper and set aside. Preheat oven to 425F. Combine flour, baking powder, baking soda, sugar and optional cinnamon together in your food processor and pulse a few times to ensure even distribution of ingredients. Add banana, about 6" worth, and allow the motor to run until a dough forms, about 45 seconds. Transfer dough to a bowl and, using clean hands, mix with about 3/4 cup (start with 1/2 cup) of the cooked sweet potato. The dough should be wet and dough-like -- wetter than most pizza dough but dryer than cake batter. It should be similar to the batter for Bisquick drop biscuits, if you've ever made those. Drop large spoonfuls onto the prepared cookie sheet and bake 5-10 minutes, until a toothpick inserted comes out clean and the edges and bottom are turning golden brown.